No snoop for you, buddi? It's every parent's dream - reliable and easy-accessed information on what your offspring are up to. Electronics systems such as Spyphone II 8210 actually allow you to dial into your child's mobile, and eavesdrop on their conversations. 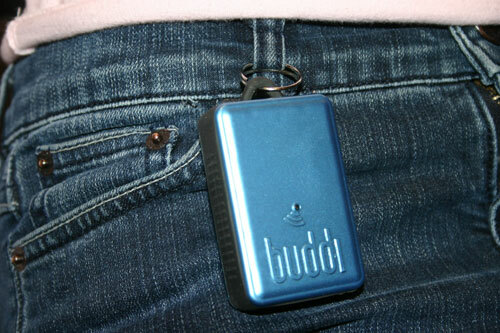 And now, there's the "buddi", which will track wherever the brats go, showing a GPS path every 30 seconds. But is buddi anything more than just a paranoid parent tool? Sara Murray, inventor of the buddi system, tells the poignant story of how she lost her daughter in a hypermarket one day, and it's clear that she doesn't see it that way. "I asked the security people for help finding my daughter," she recalls. "The guard knew exactly what to do: 'Go stand by the exit from the car park, and look into the back of every car which goes out,' he said. That put it into perspective." The technology looks pretty standard; a GSM SIM card in a GPS receiver. Both GSM phone networks and GPS satellites can be used to give a position fix, and most modern smartphones have software which could do the job. Don't they? Apparently, no. "For a start, the components in a normal phone or GPS device are not up to the job," says Murray. She spent "a couple of months" going through electronics catalogues from chip makers and designers in the Far East, "and there was nothing on the market we could have used. All the devices were too large, for a start. And they used only the cheapest components which meant they weren't sensitive enough, and would lose a GPS signal indoors." What Murray wanted was a "panic button" which would allow the user to call for help in emergencies – and indeed, initial sales are flourishing with the customers being local authority users. They send people out into tough neighbourhoods, where pulling out a standard mobile and dialing 999 (or 911 or 112) is probably just another way of inviting phone theft. They need a one-push response which tells the support team exactly where they are, and tracks where they have been, instantly. "With the buddi unit you just squeeze the sides, and the parent or the control team gets all the information," explains Murray. The claim that this is the first integrated technology system of its type will raise eyebrows. Several smartphone devices are being promoted as suitable for "location based services" on the grounds that they crosslink GPS tracks with GSM mast signal triangulation, allowing advertisers to target potential customers. The Holy Grail of these products is to have, for instance, the staff of the Financial Services Authority phone on your list, and ensure that your takeover plans are displayed on every public screen and "live" advert hoarding just before they come round the corner and see it. Equally, security forces would love to be able to trace terrorist operatives with precision; and of course that means that legitimate dissidents are coming to fear that their movements may be tracked with equal precision. Privacy activists are, therefore, hostile. The advantage of buddi is simple: it's voluntary, as well as precise. The buddi box is "the size of a matchbox" says the PR. You clip it onto your belt. So, where does the "snooping" issue arise? The buddi team would say it doesn't. But it is true that you can "dial in" to the unit to query it, and get a GPS track of where it is, and where it has been. Some reviewers have taken a negative view on this, seeing it as overly protective.